The way a city uses and reuses space has a powerful impact on its identity and economy. While some cities are experiencing a development boom and others a building slump, urban agrihoods could provide much-needed food, employment, and green space to cities trying to rebuild. That’s the idea behind the Michigan Urban Farming Initiative’s (MUFI) two-acre farm and agrihood-in-development in Detroit’s North End neighborhood. 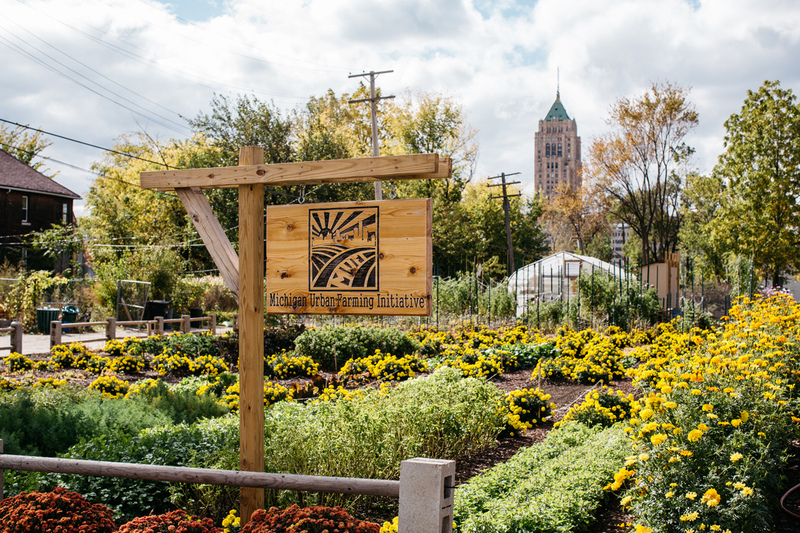 Billed as the “first sustainable urban agrihood” in the U.S., and MUFI’s current agricultural campus includes a two-acre farm, orchard, and children’s garden; since 2012, it has distributed over 50,000 pounds of produce to local residents, nonprofits, and businesses. MUFI is 100 percent volunteer-run and during MUFI’s open market Saturdays, “anyone in the community can come and collect as much produce as they need for themselves and/or their family for free,” said Jeffrey Pituch, MUFI’s director of development. This food distribution will continue as their agrihood evolves with the addition of a community center, two kitchens, a café, and several other community renovations and programs. And while the definition is changing and growing, a report by the Urban Land Institute notes that agrihoods are “master planned or residential communities built with a working farm as a focus.” Rancho Mission Viejo, a housing developer and longtime ranching family in southern California, has even trademarked the term “agrihood” and applied it to their new Esencia development. At MUFI’s North End agrihood, the nonprofit manages the pre-existing urban farm and handles quality control through its trained volunteers. Tyson Gersh, MUFI’s co-founder and president and a senior at the University of Michigan-Dearborn, said that, unlike most existing agrihoods, MUFI’s project will be comprised of a combination of existing and new residents in the North End without formal membership boundaries. Agrihoods usually face one of two challenges: rural regions lack the density necessary to support their operations, and urban areas often lack available space. Cities like Detroit that are suffering from broad population loss have both people to feed and land to spare. In Detroit, right now, MUFI is in the midst of an expansion and transformation that aims to benefit the community. The group is repurposing spaces within the three acres they occupy on Brush Street in order to formally establish their agrihood and broaden the span of their programming. They are converting a long-vacant, three-story building next to the garden into a Community Resource Center (CRC) that will eventually offer workshops, an industrial kitchen for community member use, a nonprofit incubator, a local farm-to-table café, and more. The CRC will offer classes in cooking, nutritional literacy, and agricultural and horticultural skill development. The for-profit café will support the agrihood, with discounts provided to residents who purchase a low-cost café membership. Among the other works in progress are creating a water-harvesting system out of a damaged and deconstructed home’s basement, transforming an abandoned home and shipping container into student intern housing, and the construction of new raised community garden beds. He acknowledged the risk that making a neighborhood more desirable can lead to long-time residents getting priced out. He expressed his and MUFI’s desire to make sure that current residents can remain and reap the fruits of the agrihood’s labor. MUFI’s leadership team, who all live in the community themselves, hope to achieve this by both maintaining and building one-on-one relationships with their neighbors. He said MUFI has and will support current residents through efforts such as piloting affordable housing initiatives, developing subsidized financing models, and directly assisting in home repair programs. “Let’s prioritize green space and see how much better the quality of life gets for everybody when we do that,” Gersh said. Top photo credit: Michelle & Chris Gerard. This is a great article about the emerging trend towards saner, sustainable housing developments. I posted it on my Agrihood page, where I'm trying to spread awareness and demand for this. So glad to know about this effort. As mentioned above Frithjof has talked and described this sort of enterprise for decades and now they are evolving and thriving. Good work on thinking about gentrification complications. acres since 1993. Always looking for ways to reach out and teach.